Auditorium Shores makeover plan would limit the park's off-leash space to the western end. 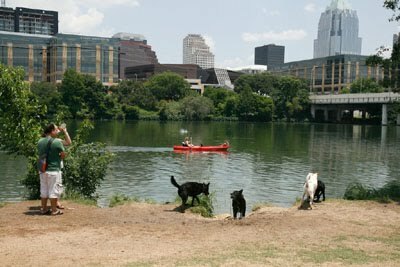 For a city that strives to be on the cutting edge of all things trendy, Austin lags behind a national shift toward creating more off-leash dog parks – what the Trust for Public Land has called the fastest-growing species of city parks in America, with Portland, Ore. leading the pack. Indeed, according to advocacy group Friends of Austin Dog Parks, Austin has steadily downsized its off-leash acreage while other cities have added more space. The shrinkage argument is amping up in advance of a Dec. 10 meeting of the Parks and Rec­re­ation Board, which is set to vote on a proposed redevelopment plan for Auditorium Shores. That plan calls for reducing the existing 18 acres of off-leash space to about four acres (up from the originally proposed three acres). The iconic shoreline park has been a popular dog-romping spot for several decades. The stretch of open space has also featured in the city's long-running discussions about upgrading and improving the park as part of the Town Lake Metropol­itan Park master plan process, but funding shortages hampered those endeavors until concert promoters C3 Presents stepped up last year with a $3.5 million donation. Then it was full speed ahead on the Shores. Under a partnership that includes C3, the Austin Parks Foundation and PARD, the makeover calls for new grass and an irrigation system, shoreline erosion controls, and a newly segmented park with a "main lawn" event venue on the east end, off-limits to all dogs, a "middle lawn" for other activities (leashed dogs only), and on the west end, an off-leash space with lake "launches" and other bells and whistles that dog advocates say they didn't ask for. PARD's Marty Stump, who's overseeing the park project, said some minor revisions to the off-leash park (including a "modest increase in size") will be released Friday as part of the backup material for the Dec. 10 meeting.